The Sidebar: What Katz hears: After being busted for sock puppetry, prominent Yale prof/author claims to be the victim of "cabal" that has "been bullying me relentlessly"
What Katz hears: After being busted for sock puppetry, prominent Yale prof/author claims to be the victim of "cabal" that has "been bullying me relentlessly"
Two of my columns for the Huffington Post have been retracted, and believe it or not, that has something to do with a well-orchestrated effort to scuttle national nutrition policy, and get you to eat more meat, butter, and cheese. ...(Backed) by billionaires with ties to such enterprises as Enron, and the beef industry...their intentions are clear enough: they would like to scuttle the translation of the 2015 Dietary Guidelines Advisory Committee Report into actual Dietary Guidelines for Americans, and thus- sabotage national nutrition policy so [sic] suit their personal inclinations. ...And that’s where the dots finally all connect. I first voiced my grave concerns about these egregious misrepresentations of current nutrition science, to say nothing of the indelible ties between dietary patterns and the fate of the planet, back in May of 2014. I have done so repeatedly since, because it is my job. And, I have apparently done so with enough people listening - thanks to you, my on-line following is well over half a million - that I am of particular concern to the cabal in question. So, as I have noted before, they have been bullying me relentlessly for months. Most of this has been indictment by innuendo in cyberspace, with every derisive suggestion - he has done industry-funded research, his opinions are for sale - retweeted ad infinitum by other members of the same club. One of the great liabilities of social media and the blogosphere is that any given small group - including a band of wingnuts living in their mothers’ basements - can create enough echoes to seem like a movement. In the current case, it is now clear that the aspersions directed at me were of the “keep throwing dirt until something sticks” variety. My opinions are not for sale, and I was raised by good and loving parents to be an honest and honorable person, so not much stuck. Until the group stumbled on those posts about reVision, which apparently hadn’t bothered a soul. Dr. Katz's article includes no evidence to back up any of his allegations, therefore it's unclear how he arrived at such conclusions. In any event, here are the facts with a timeline. That afternoon, I reported Katz out of the bag: Did prominent Yale doc/prof/columnist shill review a book he wrote under a pseudonym? I've asked Amazon to take a look. October 2, 2015: For a follow-up item, I e-mailed some questions to Dr. Katz. reVision, however, is not at all the relevant story here. The real story is this: a group attempting to scuttle the Dietary Guidelines in the US, funded by billionaires with ties to the beef industry and Enron, is unhappy that I have defended the dietary guidelines (that IS my day job), and that I have been among the many prominent voices pointing out their ulterior motives, and erroneous statements. In return, they have gone looking for any basis to discredit me, and the best they could find was... this. My closet is unusually pristine. Write about reVision if you want (I recommend you read it first)- it will be the best exposure that book has had! But you are certainly being duped, and covering the wrong story- and you will be working at the behest of the likes of Enron, and the beef industry. My hope is you have more laudatory aspirations than that. I can assure Dr. Katz that I'm not part of any cabal, conspiracy, or smear campaign against him. I'm an unpaid, independent blogger who has tagged dozens of shill book reviews on Amazon. That's what led me to his review of reVision and his two Huffington Post columns in which he lavishly praised the novel without informing readers that he wrote it. Instead of trying to change the subject, he should man up and explain what happened. Peter- apologies if I overlooked your prior missive; my inbox is a busy place. But Katz omitted a crucial detail from both reviews: the subject of his praise was his own self-published passion project, released two months earlier under the pseudonym Samhu Iyyam. ...Fred Brown, a spokesman for the Society of Professional Journalists, told the News the Huffington Post column was blatantly unethical, and the blogger, Peter Heimlich, who wrote about the Amazon review in late September and ontacted the News shortly after, said he is not involved in the debate over the guidelines. ...“Instead of trying to change the subject, [Katz] should man up and explain what happened,” Heimlich said. Heimlich added that he has sent a formal complaint to Amazon asking that Katz’s product review be taken down. Correction: I never complained to Amazon or asked that the review be taken down. For a follow-up item I was reporting, via Amazon's Public Relations department I inquired whether Dr. Katz's review was in compliance with Amazon guidelines. The complete correspondence is posted on my Scribd account. November 14, 2015: I blogged And he scores! Amazon scrubs "sock puppet" five-star book review by prominent Yale professor, author, columnist. 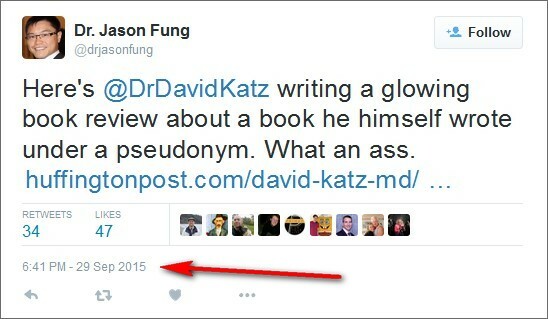 November 18, 2015: I blogged Huffington Post deletes two columns by prominent Yale professor/author David L. Katz MD; "undisclosed conflict of interest." My correspondence with Huffington Post editors (which includes the e-mails I exchanged with Dr. Katz) is posted on my Scribd account. 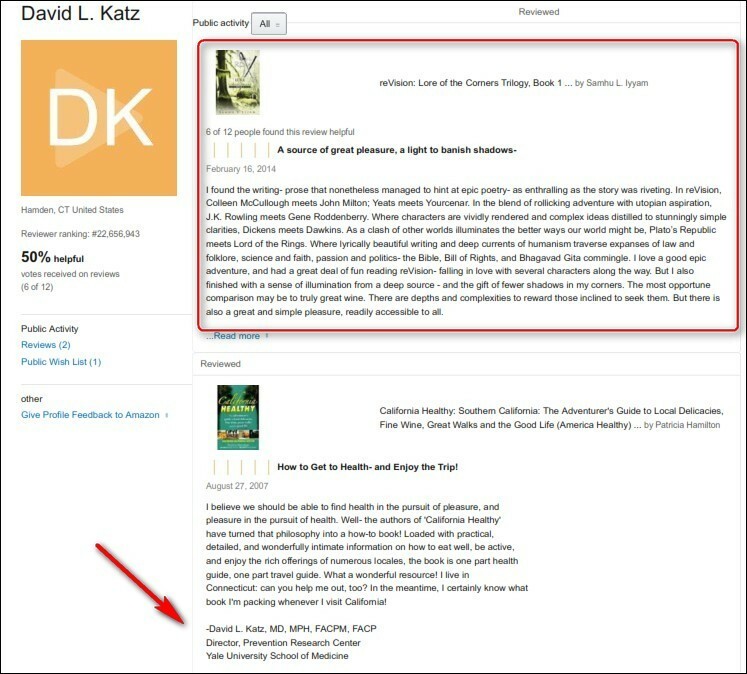 The Huffington Post has retracted two blog posts by prominent Yale nutritionist David Katz after learning he had posted incredibly favorable reviews of a new novel - and not revealed that he had written the novel himself, under a pseudonym. There’s no doubt Katz is a prolific writer - in addition to a couple hundred scientific articles and textbook chapters, Katz regularly blogs for the Huffington Post. He’s also the author of a novel, reVision, under the pen name Samhu Iyyam. Last year, Katz wrote a pair of incredibly favorable reviews of reVision on The Huffington Post that implied he had discovered the novel as a reader. The Huffington Post has taken them down, as blogger Peter Heimlich — yes, related to the maneuver - reported earlier this week. According to Heimlich, a 5-star Amazon review of “Iyyam’s” book, written by Katz, has also been removed. In the reviews, there’s no hint that Katz is the author. Per our correspondence, I explained to Dr. Katz that after I finished reporting about reVision, I wanted to learn more about his allegations about being the target of "a cabal." I'll ask him for details and report the results. Finally, to my knowledge, Dr. Katz has yet to address why he wrote the Amazon review without disclosing that he was the author.